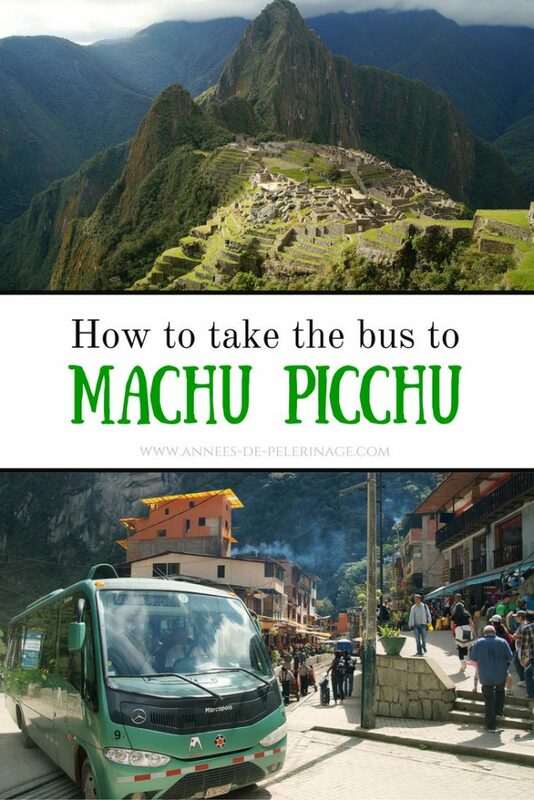 A detailed guide on taking the bus to Machu Picchu – by far the cheapest way to reach the Inca ruins. Rumor has it that there are only two ways into Machu Picchu: The train from Cusco or doing the Inca Trail. Both options will cost you at least a 100 US-Dollar, so one of the most common questions of frugal travelers is: “What is the cheapest way to travel to Machu Picchu.” Sadly almost no tour company will tell you the dead cheap secret that there is indeed a way to reach Machu Picchu by bus. But let’s take things slowly. Strictly speaking, there is no road leading to Machu Picchu. There are indeed only the train tracks and the Inca Trai (note: there are currently plans set into motion to build one). So the approach by bus is a bit more indirect and will involve walking the last 5 kilometers. It will also take considerably longer to reach the Inca ruins so this might only be an option if you are low on money but got plenty of time. It will also mean you will have to pack wisely (check out my Machu Picchu packing list), as you will do the carrying. If that doesn’t scare you, here’s how you’ll do it. Assuming you start from Cusco, you will first head to Qulliabama. 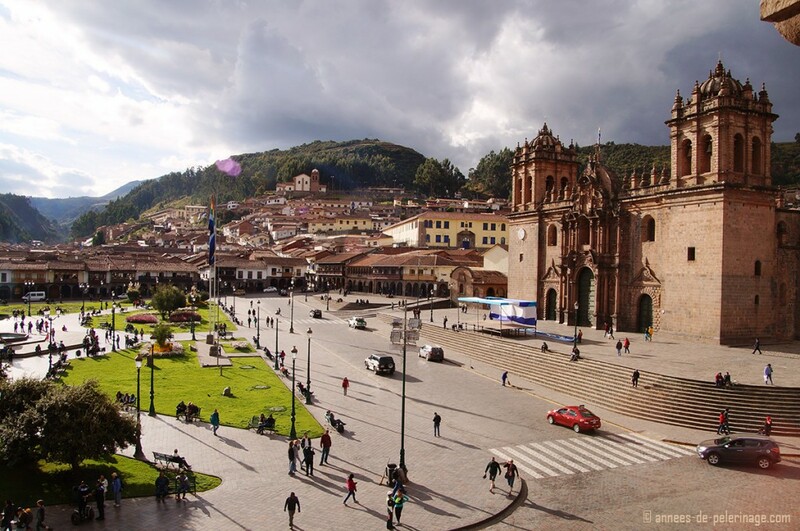 Buses, taxis, and collectivo buses are regularly leaving from the Terminal Santiago in Cusco. You might have to take a taxi for 3 or 4 soles to get there. Quillabamba is one of the bigger cities in the jungle, but you do not have to drive all the way there. 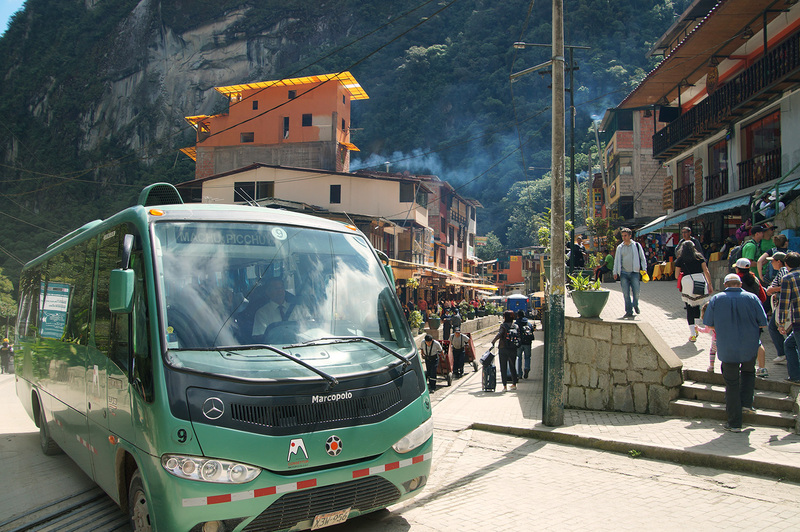 Instead, you have to get out at Santa Maria, which is just another of the thousands of small villages in Peru. The price will be between 15 and 20 soles, and it will take you between 4 and 6 hours. Once you are in Santa Maria you will have to take a taxi or a collectivo bus to Santa Teresa. There should be other people heading in the same direction. It will probably cost you around 5 to 10 soles in a shared taxi. The road is not especially well maintained but reasonably safe during the dry season. 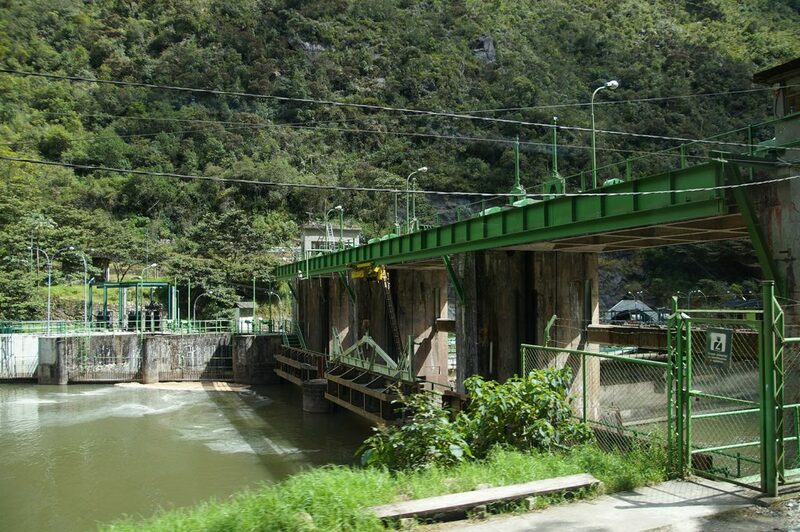 From Santa Maria, which is yet another in the middle of nowhere village, you have to get to Hidroelectrica, a hydroelectric plant sitting on the Urubamba River. This is the closest you can get to Machu Picchu / Aguas Calientes by road. The only way to get to the plant is by (shared) taxi. You might opt to stay a night in Santa Teresa since there are actually wonderful thermal springs to be found on the outskirts of the town – way less crowded than in Aguas Calientes and in a better shape. The taxi to Hidroelectrica will take around 25 minutes. Do ask the driver who took you to Santa Teresa in the first place if he wants to go on to Hidroelectrica. Most drivers are open for such negotiations. The road stops in Hidroelectrica and you have to get out. Sometimes the staff at the plant will ask you to register. They will certainly be able to tell you in which direction you’ll find the train tracks, but you should actually be able to see them. 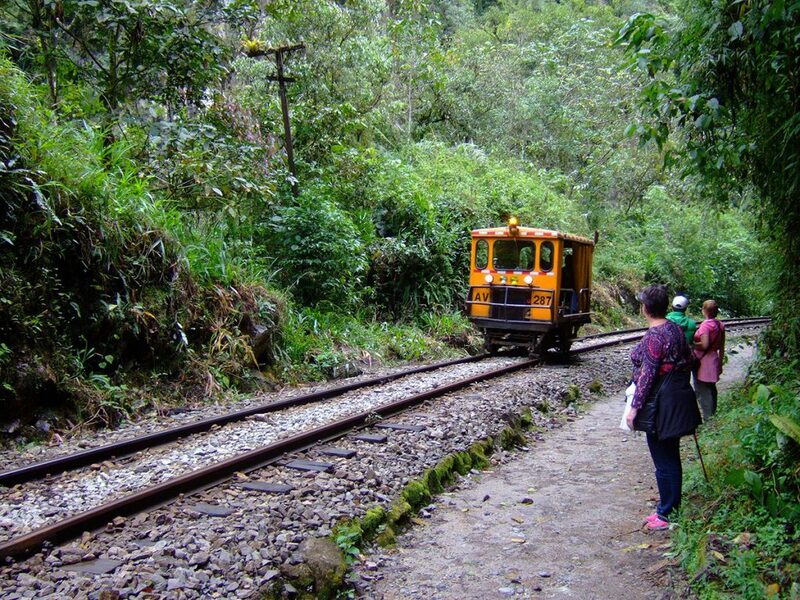 From here you have to follow the train tracks upriver to Aguas Calientes. This will take you one or two hours, covering roughly 6 kilometers. The tracks are following a loop of the river, so it is by no means a straight approach. And in case you were wondering: You do not have to be too careful with the trains, as they are driving very slowly and don’t come too often. Some travelers have reported that the train actually stopped for them and picked them up. You will probably arrive in Aguas Calientes around dusk, so knowing where you will want to stay will save you time erring around the town when it is dark. There are many hostels and even a camping ground (read more here). First of all, you may wonder why this guide is called taking the bus but frequently mentions the word taxi. Taxis in Peru are very often shared. There are also plenty of Tuk Tuks (yes the very same so popular in Thailand) so they are very cheap options to get around. There are also a lot of collectivos – small minivan bus taxis that will pick up anyone who wants to take a ride. These are normally also dead cheap. Remember to negotiate a price when you hop on. 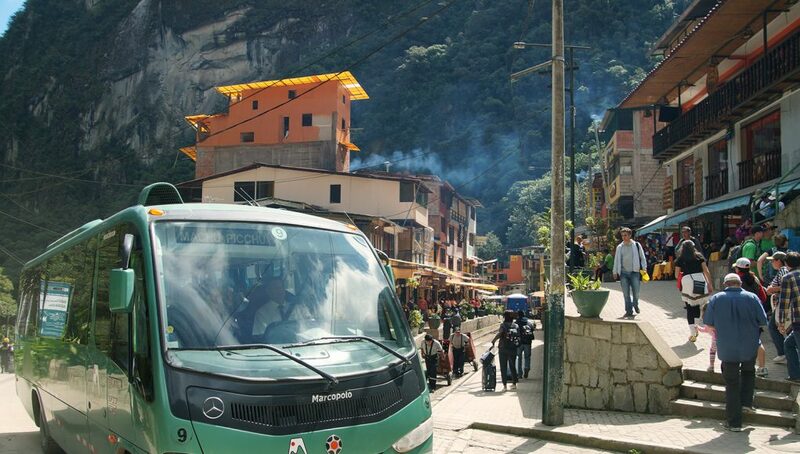 The second thing you have to consider is the sheer amount of time it takes to Machu Picchu by bus/taxi. If you start out from Cusco, you really have to take the first bus in the morning, meaning 6 am or you won’t be able to make it in time. And even then it might be already dark by the time you reach Aguas Calientes (remember to take a flashlight just in case). It might be advisable to either stay a night in Santa Teresa or start out from Ollantaytambo. Cheap hostels/hotels will be available in both towns. And last but not least, this option is only advisable if you are traveling light. You really don’t want to carry your 20kg rucksack over 5 kilometers through the Peruvian jungle and its high humidity. For full details on Machu Picchu, ticket prices, the best time to visit, and insider tips, read my ultimate guide to Machu Picchu. Hola, We are planning to go to Peru this coming May. We will be arriving in Lima on the 15th, spend a few days there, then head to Cuzco. Any ideas on the best way to get to Cuzco? Once there, we want to do a variety of things, namely Machu Picchu. We don’t want to be cheap but, we also do not want to go the most expensive way also. How do you suggest we do it from Cuzco? Should we try to get a tour while we are in Cuzco, or wait until we find a way to get to Aguas Calientes? We really need to know as we want to book our flights next week. Got a really good deal from Montreal Canada to Lima. HELP!!! Give me all your feedback that you can. We do not want to do a lot of walking between places to grab a taxi. Also, we do not speak any Spanish. Looking forward to any help you can give us. Thanks in advance, Tom. Peru in May will be great. Please kindly understand that I can’t do any travel planning for you. I work full time and this blog is just a hobby. Wonderfull article, you covered almost everything in a small way. Not many people know about this path and some articles list it as a risky trip, but it is not true. The fact is that it is not a known tourist path so you will not find the same facilities and acomodations you would in the tradicitonal way, but to me this means you will get host and food at decent prices. I will add to your article that it could cost a rough 25-40 soles (+/-$10-13 dollars) “per skull” to get to Aguas Calientes… very nice indeed. This is in fact very very cheap compared to the $126 bucks (Nov 2018 cost) train ride although as you said, you will need more time and a few hours walking. A trip for two will save me and my wife about $200 dollars so I dont mind about it, its part of the trip. Just keep in mind that travel time and effor is doble because you have to get back the same way. So this means this could not be for every body or for those with a tight agenda. By the way, $126 for a round trip is quite expensive, train if fine but it is not worth it, beleive me. About 10 years ago I had the oportunity to meet one of the train´s police guys which by the happened to be a Machupichu guide in his spare time, so we arranged a deal for a bundle and wonderfull trip and traveled in the citizen´s train (only for peruvians) for just $20 soles round trip with guide included. I dont think this could be done anymore because laws are more strict now, I guess. I will definately consider this option. I myself will save all that money and invest it all on lots of the best drinks you can find in the world “Pisco Sour” at many of the bars in Cusco… that being said, it means I already have a plan for next year :).